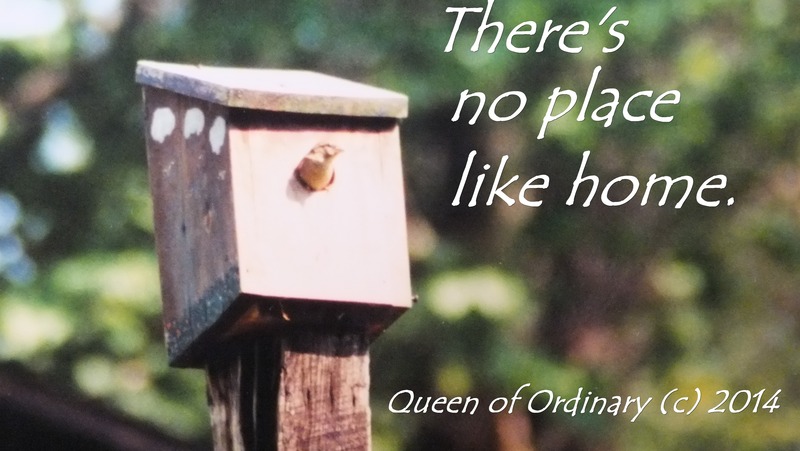 I watched this little bird make trip after trip to her little birdhouse with bits of grass, strings, or straw. She was working so hard to make her little nest comfortable. I don’t have a fancy house, or big by most standards, but I am so thankful to have a home period. I spent many years in apartments or rental houses before I bought a home. The truth is that all of those places were HOME for a season, and perhaps this house is only temporary. In every place I’ve ever lived, I am always aware of the sweet feeling of “coming home,” at the end of the day or at the end of a trip. There is a great comfort in pulling in the parking place in front of the place you belong. I love the sense of peace that permeates my house. I feel welcome and other people say they feel safe and comfortable in my house. That is the best thing about it. I don’t have a lot of guests, but when I do, I want them to feel peaceful and welcome. I don’t think I’ve ever lived anywhere that felt permanent. Maybe that’s because nothing on this planet is permanent. I just finished watching a video posted on facebook about sloth babies. There were several links. Who knew baby sloths could be so cute? I started thinking about the animals I have photographed and it seems to me that my favorites among mammals are always pictures of the babies. I find animal behavior fascinating between mothers and offspring, as well as between siblings. I am amazed at the instincts even the youngest animals possess and the way they communicate with parents and with each other. 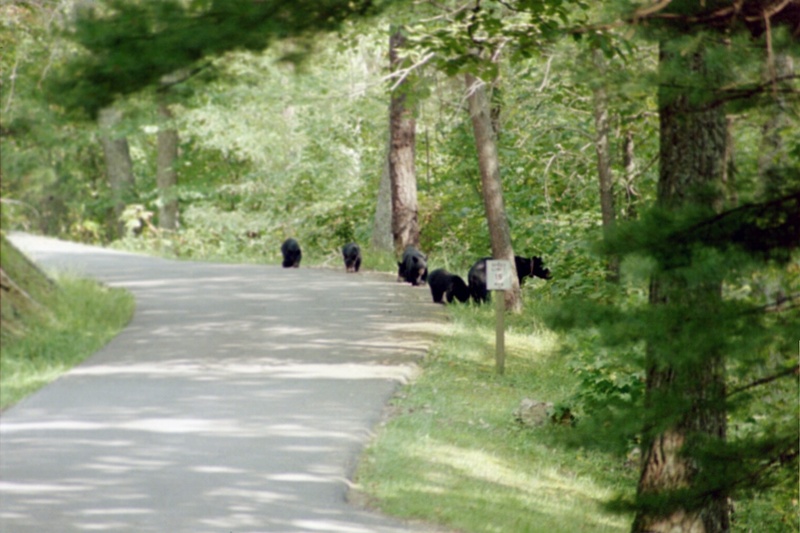 It was my great privilege a few summers ago to watch a mother bear with her FIVE cubs and Kingdom Come State Park in Cumberland, KY. A mother bear usually only gives birth in January to one or two cubs. Three is unusual. Four is unlikely. Five is extraordinary! One of the children in the group named the mother bear Mimosa. We also named the cubs: Alpha (the male who dominated the other four and followed in his mother’s shadow always); Hickory (the tree climber who fell out of one onto the road and nearly killed himself); the twins (who were identical and always stuck together); and Runt (because he/she was the smallest of the five and always the one tagging along behind). These bears showed great intelligence, affection for each other, playfulness, and curiosity about the world around them. The mother bare cared for them, taught them, and stood on the ready to protect them. 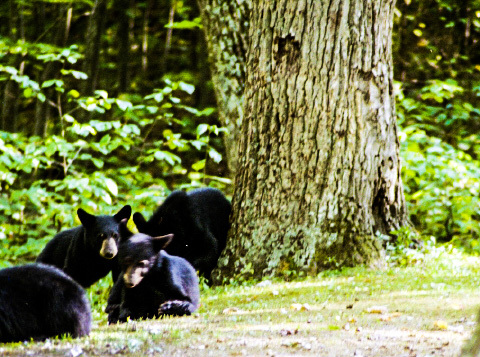 Catching sight of them was a thrill and on the occasions when they came out in a place where the Bear Watchers could watch them for half an hour or so was a pure joy. 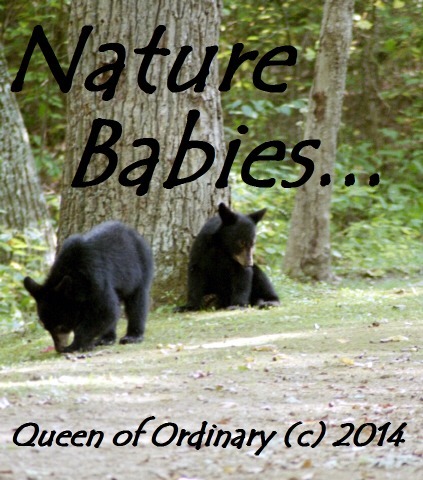 We learned a lot from these nature babies. I will attach more photos below. I have been doing some cleaning lately, not only at home, but also helping a friend getting ready to move. Sweeping is essential to getting any house clean. I have hardwood floors in about half of my house. It is amazing to me the amount of debris I can sweep up in my house every single day, or twice a day with only me in it. Where does it all come from? I have decided that carpeted floors get the same amount of dust, lint, and other bits of debris, but they don’t always show up as much because they get down in the carpet fibers. It is possible to sweep hardwood floors clean, mop, dust, steam clean, or all of those and if a single person has been outside or in the basement, they will track particles back onto the floor with their shoes. Our lives are like that with sin. We can repent before God and make things as right as we know how to make them, swept clean, but there will be little things that try to reattach to us at the first opportunity. Perhaps the debris that gets into our spirits is as small as an angry word, a scowl, repeating information about someone, or just neglecting to take time with God in each day. If we are diligent to sweep those things out on a daily basis, they don’t get out of control. If we fail to keep the cleaning process going, it doesn’t take long for the dirt to accumulate. 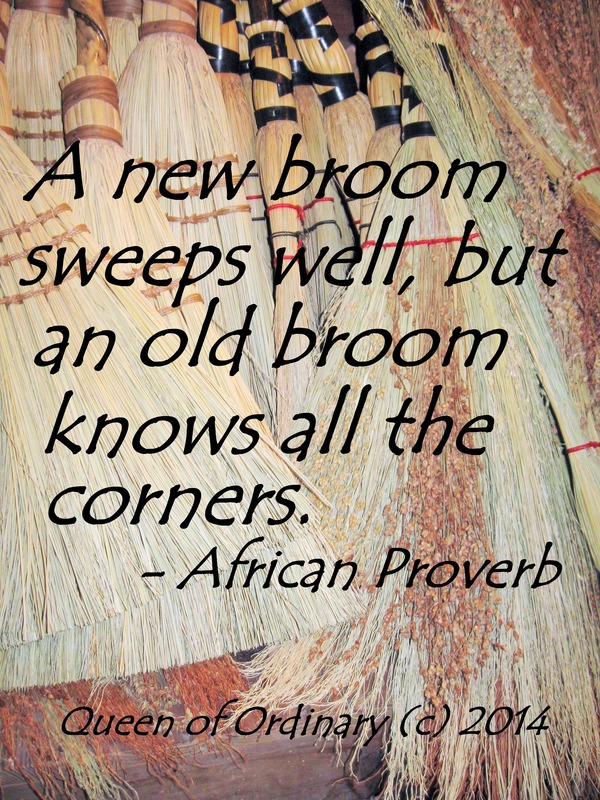 We all have need of a good sweeping on a regular basis. We all have dreams, and some more than others. Some people have a gift of dreaming big and following those dreams. Some dream marvelous dreams, but never have the courage to try to see them come true. I have been accused of being a dreamer. Maybe that comes with the rest of my personality. I do dream of many impossible things coming to pass. People often stop dreaming at an early age because their dreams never seem to come to pass. They can’t handle the waiting or the disappointment of unfulfilled dreams. Sometimes our dreams are shattered by circumstances beyond our control. Other people in our lives make decisions that alter our dreams. 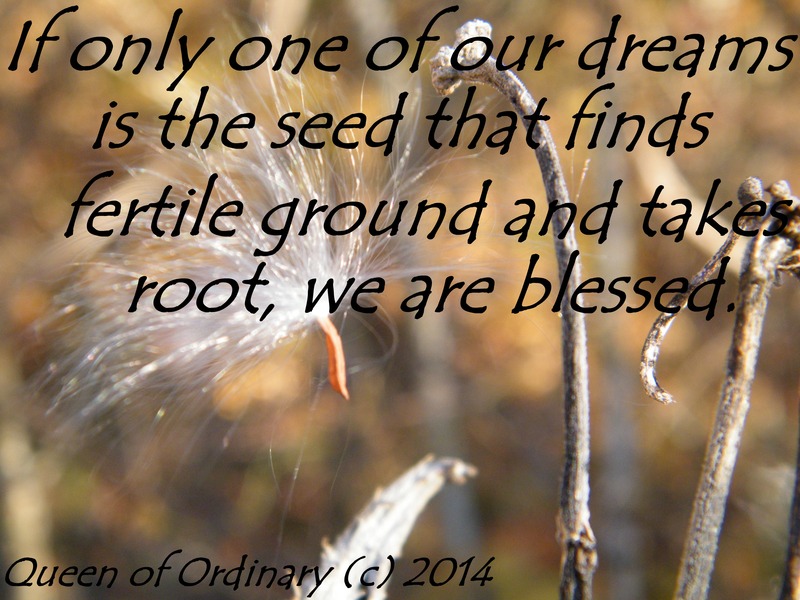 If dreams were the seeds of a milkweed pod, we could see them floating away on the wind to destinations unknown. Some will land in the water, some on rocky ground, and some will be eaten by birds. All it takes is one of those hundreds of seeds to fall on fertile ground under the right conditions, and a new milkweed plant will spring up, full of even more seeds of dreams. 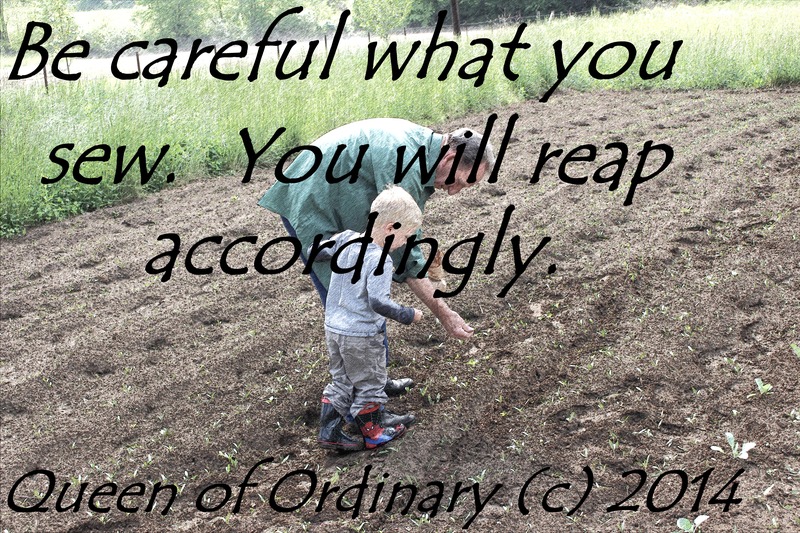 Jesus spoke of sowing seeds. A cemetery is perhaps a peculiar place to go for remembering, but it is one of the best places to have a reality check. Have you ever gone to an unfamiliar cemetery and walked through? I love to look at the statuary, the inscriptions, the dates, and names. Perhaps that is because of the writer in me. Each grave represents a lifetime of little stories and one big one from beginning to end. 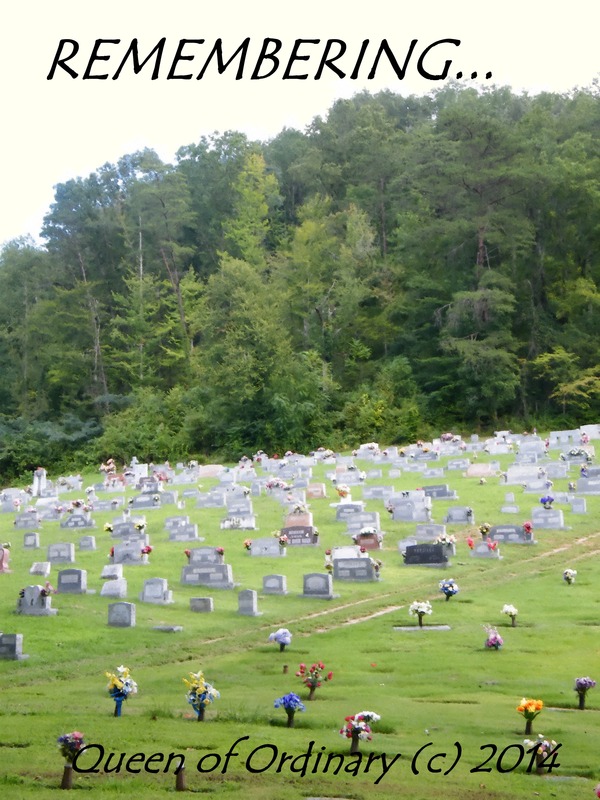 What do cemeteries cause you to remember? Loved ones who have passed. Loves that have died. Friends you haven’t talked to in a long, long time. 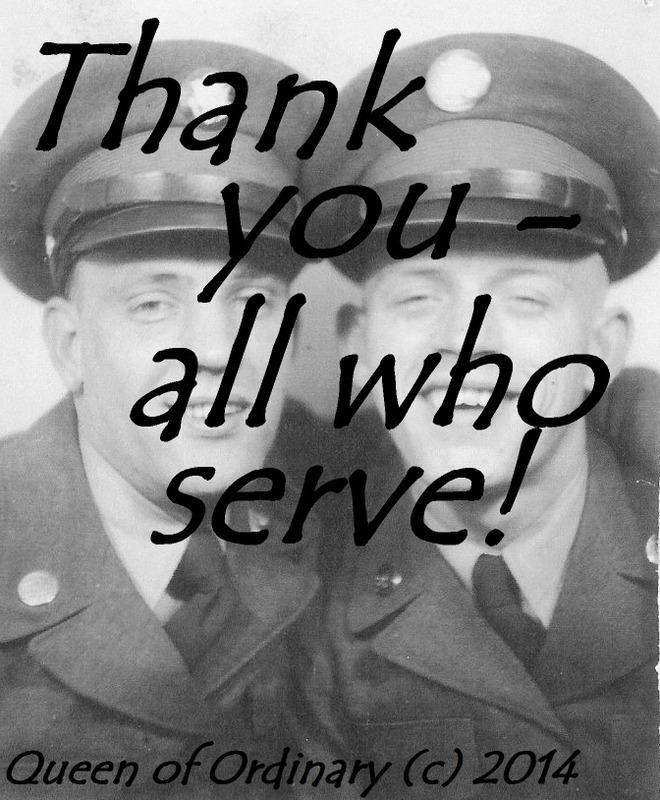 Accidents, tragedies, illnesses, old age. Time, mortality, immortality, unfinished business. Regrets, loss, empty spaces. Prayers. Songs. Lives well spent. Lives squandered. Lives in progress. The importance of each day. Keeping promises. People we love. Eternity. Our relationship with God. Things we hope to accomplish before we die. Priorities. Making a difference. Endings. Cemeteries are a good place for remembering. Sometimes when I’m driving through the countryside, I have the most peculiar thing wash over me. It is an inexplicable yearning for things that I know not. 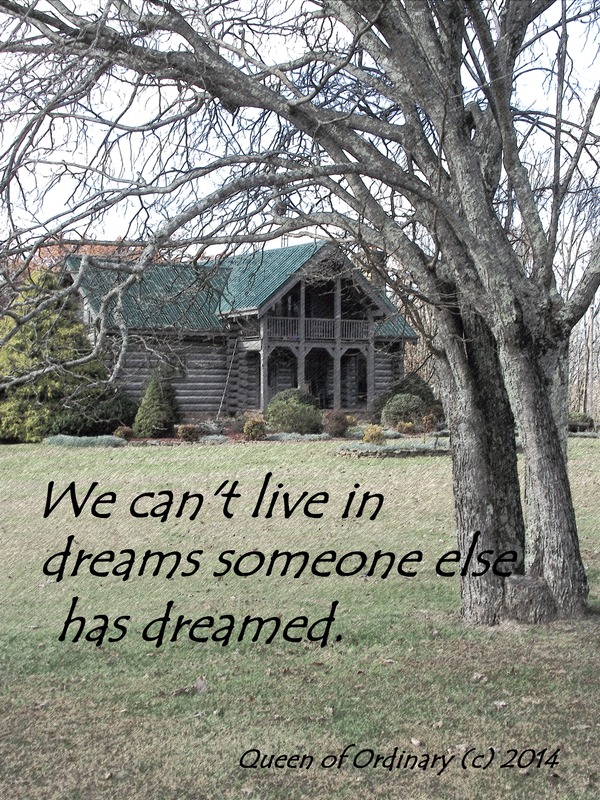 It hits me unexpectedly, perhaps when I see a particularly lovely home that is well situated, or perhaps a rolling field with a barn and animals. It is almost as if there is a longing inside of me for the life that could have been mine, but wasn’t. There are so many paths each of us may choose and different forks along the way. We dream of where we want to end up and do our best to get there, but it doesn’t always work out the way we had hoped. I often wonder about the people behind the walls of houses in strange neighborhoods. Are they happy? What do they do for a living? Is there love in their household? How many children do they have? How do they spend their time? Sometimes I think the luckiest people in the world are the ones who live at the head of a hollow, or on the edge of some remote lake, or in the wilderness. The ones they love are close around them, their daily necessities and chores lie before them, and they are happier in the process of daily living than the rest of us – or so it seems. My dreams and my reality are certainly two very different things at this point, but I haven’t given up dreaming. The Bible speaks of deep calling unto deep. I wonder if that feeling applies to my longing for things I cannot put a name to, things that are drawing me that I cannot see. The melancholy yearnings of my heart most often speak to me of what might have been but was not… of the dreams I dreamed that someone else has taken over… of the unseen places I have yet to discover. The Bible speaks of yearnings and longings of our soul. Perhaps the yearning that I feel is for eternity, where I will be forever in the presence of God and all things will be put right. We are, after all, only pilgrims and strangers in this earth, created for a higher destiny than this world has to offer. Being a daddy is a tough job. A family’s security an protection are found in the presence of a strong father who knows how to love those in his care. 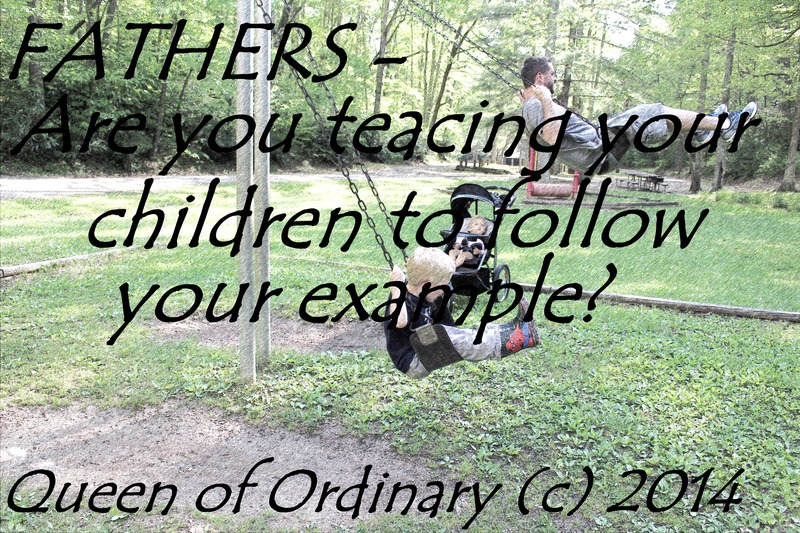 Sons look to their fathers for wisdom and teaching about the hands on responsibilities of life. Sometimes dads fail. They don’t set good examples. They are self absorbed in their ambitions under the guise of being a good provider and lose sight of what’s most important. To the sons of dads who let them down, I encourage you to be the one who breaks the cycle your father may have set before you in an unhealthy way. You don’t have to follow in your father’s footsteps. Learn from him – even if it means learning what mistakes to avoid. You will always only have one biological father, and so will your children. Be the dad your sons can be proud of and the type of man your daughters will marry. Even when you don’t know it, they are watching you, learning from you, and trying to be like you. If your dad let you down, let that motivate you to be the dad who doesn’t. When my son and grandson came to visit, my dad (Pappaw) decided they needed to plant some beans together in the garden. Men, please remember that your sons and grandsons are watching you and following your cues about how to be a man. And your daughters will love you and try to find a man like you to marry. Are you the man you want your son to become? Are you the man you want for a son-in-law? Women, are you teaching your daughters that a beautiful spirit is more important than physical beauty of the things she puts on? Are you teaching her to sexualize herself to draw attention from men? Is she going to grow up to be a good mother and wife? If she imitates you, will she be the wife you would want for your son? Have you been hurt in your life by other people? or by a specific individual? Have you ever wanted to hide away behind locked doors where no one can ever hurt you again? Have you built up walls to keep others out? Have you locked the door to your heart? I was there many years ago. I was so hurt and betrayed by someone I loved with all my heart, I felt like I had to protect myself because another wound like that would have mortal consequences. I didn’t want to have to endure that pain again – ever. God showed me a vision of myself hoping that someone would break down the wall, see the real me, and come charging in to rescue me from ever being hurt again. Yet while I was hoping, I was steadily placing one brick with mortar at a time in place to build my wall higher and thicker all the time. God never called us to be brick layers that shut ourselves away from the rest of the world. I also realized that the person who had caused such grievous injury was out in the world carrying on, living large, and could care less what I was going through. I forgave. Over and over I chose to forgive, and tear that wall back down one brick at a time. I wanted to stay safe, but I wanted to be free more than that. Here are some of my favorite Bible verses about freedom. II Corinthians 3:17 – Where the Spirit of the Lord is, there is freedom. John 8: 36 – Whom the Son has made free is free indeed. Psalm 118:5 – I cried out in my anguish and the Lord heard me and set me free. 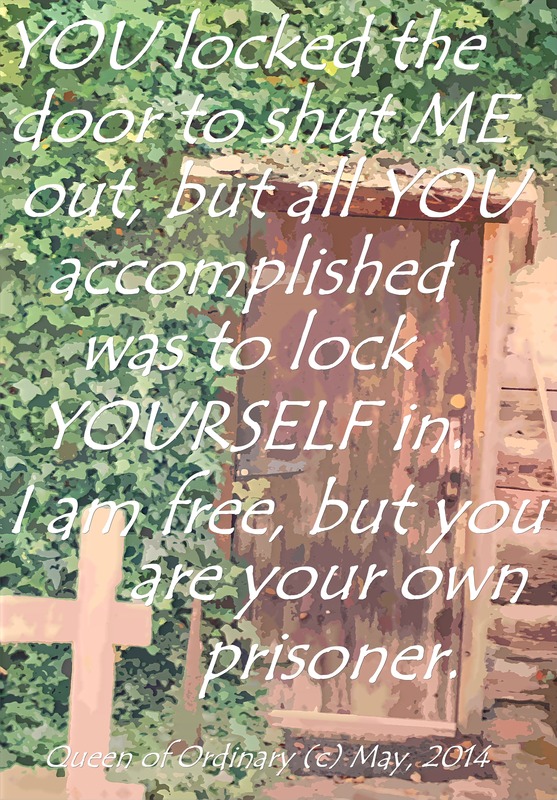 Are you a prisoner of your own making? Have you been hiding out behind your walls of captivity in an effort to keep hurt or harm away? I urge you to tear down the same walls you built up; unlock the door; and be free. Forgive. It is the greatest gift you will ever give yourself.